The new widescreen line, slim and portable with a 64-Channel GPS/Galileo receiver, 4.3-inch TFT touch screen, and multimedia functions, carNAVi Pro 400 is a multipurpose navigation guide for your mobile life. Preloaded with carNAVi’s new HD Maps™ – high detailed quality roadmaps covering the whole Philippines including many thousand points of interest (POI) with perfected routing and address search. Buy carNAVi in BLADE Auto Parts Stores and Electronics Boutique nationwide. carNAVi devices are also available at the carNAVi Store online. We deliver fast and reliable within 1-2 days nationwide. 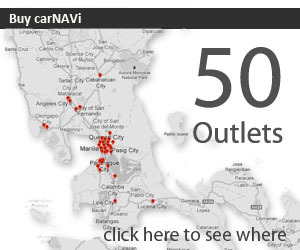 Visit the carNAVi Store at store.car-navi.ph now. The carNAVi Store offers one stop shopping for all your GPS needs. Major credit cards with PayPal express-checkout service accepted. carNAVi is a verified PayPal member, trustful online shopping and secure founds transfer is guaranteed. We offer PayPal Buyer Protection with money-back-guarantee! [Press Release, 01.03.2010] Finally you can be assured that in future you can safely reach your destination in the Philippines, even if you are visiting the place for the very first time. carNAVi developed a series of new gadgets, which will ensure that you never get lost again. carNAVi is offering affordable and easy to use GPS Navigation Assistants for everybody, who needs a reliable system for finding their way on Philippine Roads or in Metro Manila’s street jungle.